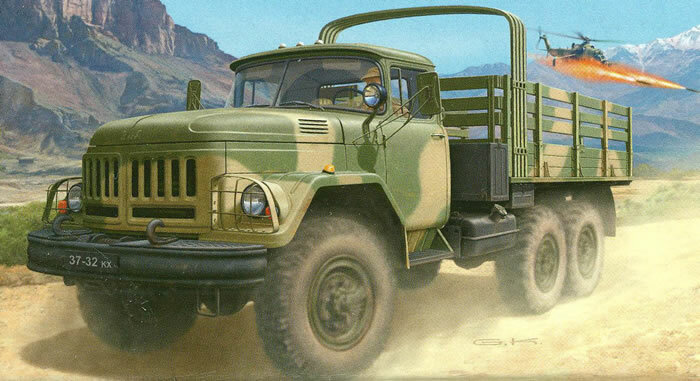 During WWII when the US shipped thousands of GMC and Studebaker trucks to the USSR, the Russian designers were embarrassed. The best they could do at the time in the medium truck class was the ZIS-5/6 truck which had only rear wheel drive (and only brakes on the rear wheels) and a very crude driveline. The US trucks had either 6 x 4 or 6 x 6 options, two-range transfer cases, and a far more sophisticated driveline and level of finish. And they were also better suited to the poor Soviet roads and the “Rasputitsa” in which the thaw turned all roads into mud. ICM introduced this kit about a year ago but now Revell Germany is reboxing it and offering it under its aegis. It is a neatly molded modern kit and presents nicely for a basic version of the truck. It is likely that ICM will do some of the other variants such as the radio trucks, radar vans and tankers in the future. This is highlighted by the breakdown of the kit’s parts which makes for simple replacement of sprues with all of the cab and chassis parts contained on all but one of the sprues in the kit. While no etched brass is included in the kit, most of the parts of this vehicle - like the M34 - are designed to be “soldier-proof” or extremely sturdy so it is not a big problem. The tires are neatly pressed vinyl but do have a center mold seam, still they run along the intersection of the tread pattern and are not too annoying. Assembly is straightforward and starts with the multi-piece chassis and running gear. The wheels are not designed to roll nor can the front axle easily have the steering turned. They are simple and very sturdy assemblies however and make for faster assembly. The troop carrier cargo body comes with optional position troop seats (but no braces and I do not have any information if it needs them - US troop benches have metal struts that fold down for support). The tail gate is only shown in the “up” position but should be easy to install in down or folded down configurations with some work. The top bows are only shown in the stowed position at the front of the body, but all of these may be cut off if the modeler wished to use the chassis for a self-propelled ZU-23 mount with a suitable twin gun mounting. Four finishing options are provided: East German NVA, 1980 (dark green over black with markings); Group of Soviet Forces Germany 1980 (dark green over black with markings); Russian Army 2000 (dark green over black with registration plates); or 40th Army Afghanistan 1980 (two-color grey/green camouflage with black registration numbers). A small sheet of decals is included. Overall, while cargo trucks can be a bit dull they are a good “blank canvas” for using asd a centerpiece or supplemental item in a diorama and will be great with figures and cargo for any scene over the past 40 years.